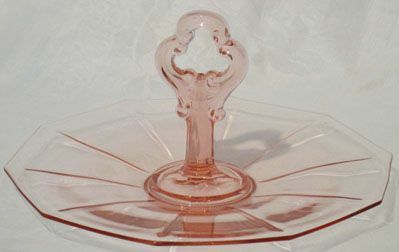 Cambridge Decagon Pink Handled Tort is 10" across and about 5.5" high at the handle (keyhole). Decagon was made in the 1930's. 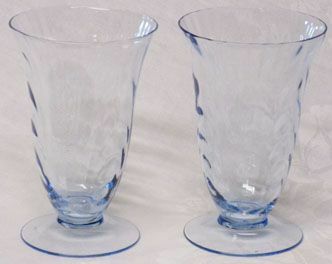 Cambridge Caprice Ice Tea Tumblers are about 5.5" tall both in mint condition. 2 are available. 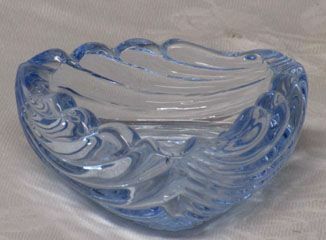 Cambridge Caprice Blue Ashtray is in mint condition. It is about 2.5" across via its tricorner. Caprice was made from 1936-57. 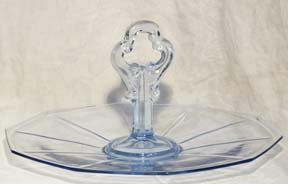 Cambridge Caprice Blue Ashtray is in mint condition. It is about 2.5-3" across. It does have the slot at the end for a matchbook or business card for a table setting. Caprice was made from 1936-57. Cambridge Caprice Covered Candy 6"
Cambridge Glass Company made this Caprice covered candy from 1936-57. It does stand on 3 feet. It is in mint condition -- and very hard to find! 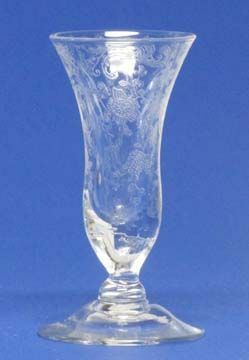 Cambridge Chantilly Cordial, #1327 1 oz. Cambridge Chantilly Cordial, #1327 1 oz. was made from 1936-58. Two are available, both in mint condition. 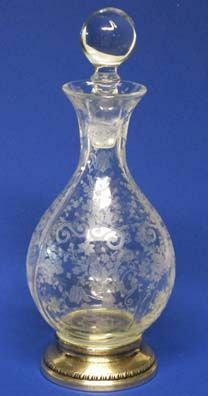 Cambridge Chantilly Etched Decanter is a rarity! with the Silver Plated Base!! This decanter is 9" tall with its stopper. Made from 1936-58. It is in excellent condition -- no scratches, no clouding, no nicks. 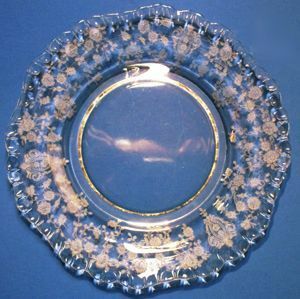 Cambridge Caprice Blue 5" square plate. In mint condition. Produced from 1936-57. 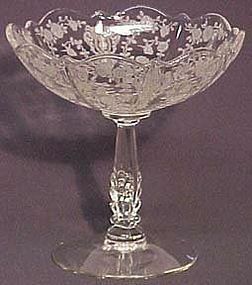 The Rose Point Etching was produced from 1932-54 by Cambridge. This Bread and Butter plate is about 6" round, in mint condition. 12 of these plates available. 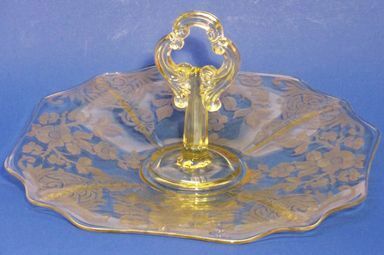 Cambridge Gold Kristol (yellow) Handled Tort, Apple Blossom was produced from 1930-40. This one is in mint condition measuring 11" square. 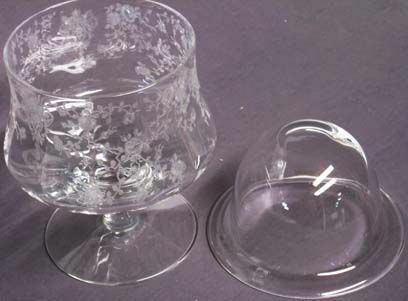 Cambridge Rosepoint Cocktail Icer (Shrimper) with liner (2 pc.) 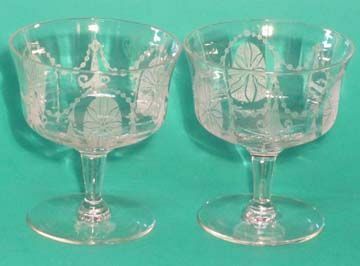 The Rose Point Etching was produced from 1932-54. This is the #968 cocktail icer. Only one available but I do have a second one with a very slight flea bite in the top rim. Just ask about it. Cambridge Majestic Etched Wines are in excellent condition. They are 4" tall. Only two are available. Produced in the 1930's. 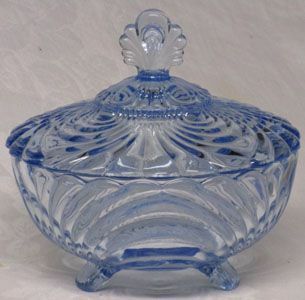 Cambridge Octagon Tort (sandwich tray) in Light Blue, Keyhole Handle is in mint condition. Measures about 11" across and about 5.5" tall at the handle. 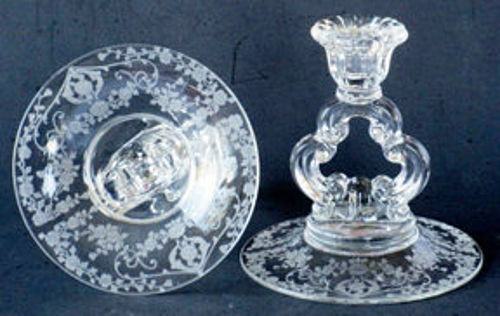 Cambridge Keyhole Candlesticks, Diane etching, Single Pair are 5.5" tall and in mint condition. Made from 1931-56. 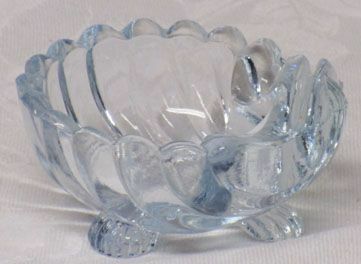 Cambridge Rosepoint Compote is in mint condition. Produced from 1932-54. 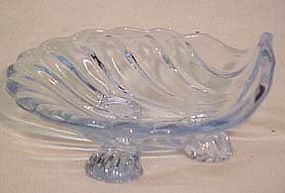 Cambridge Moonlight blue shell nut dishes (3-footed) are 3.2" wide and a heighth of 1.25" -- each may be slightly different. Three are available, in mint condition.